Special Containment Procedures: SCP-517 is to be kept secured within Containment Locker 51164 in Site-66, facing away from the doorway. A thick sheet is to be draped over the item at all times. Testing is currently prohibited, as the nature of the manifestation invariably causes a low-level containment breach. If SCP-517-01 is triggered, personnel are instructed to report to their immediate superior to enact Protocol 517-001. As of Incident 517-1997-M, SCP-517 is to be kept in a dedicated cell at all times. An opaque black sheet is to be kept bound around the object at all times. As of 08/25/1997 ██/██/2002, no more testing is to be conducted on SCP-517 without Site Director's approval. Description: SCP-517 is a fortune-telling machine. Item stands approximately 2 meters tall, containing a mechanical puppet and an electric candle within a glass and wooden case. Examination has shown an internal layout consistent with similar machines. 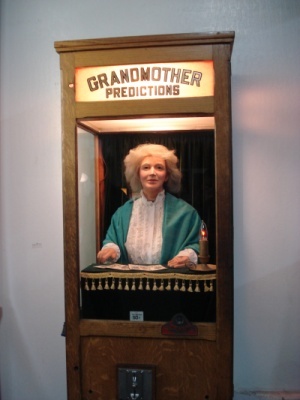 On the top panels the words "Grandmother Predictions" are painted on built-in signage. The puppet within is in the shape of an elderly woman, with a white blouse and a blue shawl. Item's power cord has been severed approximately 15 centimeters from its base; it appears to have been inexpertly separated from its original power source. No reaction occurs if a coin is inserted into the slot. The item will energize automatically, once an hour, if an individual (hereafter the "Target") enters its field of vision. The puppet will turn to face directly at the Target, dispense a "fortune card" from the slot on its front, and cease function. Process is fully mechanical, and item does not show signs of awareness. See Addendum for a transcript for examples of "fortunes". The individual who "activated" SCP-517 will become the Target of an entity or number of entities who will attack at 1:43 AM local time the following morning. The Entity or Entities (hereby SCP-517-01) appear as a varying number of long, multi-jointed arms (between ten and three dozen), initially appearing from a single area. Arms seem to be completely corporeal, and can apparently extend indefinitely. Entity will immediately rush towards and attempt to grab and capture the Target or Targets. If the hunt is made sufficiently challenging, additional arms will begin to constantly generate in close proximity to the victim in order to facilitate an easier capture. Still from D-3277's head-mounted videocamera during Test 517-34c. Image taken shortly before SCP-517-01 destroyed outdoor floodlights. ██/██/1994. Chosen areas are usually low, cramped, dark areas such as basements or closets, and will not shift during a given assault. In all instances, Targets have been captured, rapidly dragged into SCP-517-01's chosen area, and savagely beaten until sunrise. Entity has been documented reaching from the ventilation system of an office building, drawing a Target into a drop-ceiling, pulling a Target under a bed, and drawing a Target through a sewage grate. Any attempts to intrude on this event will result in human aggressors being drawn into the assault. The remains of victims are reduced to [REDACTED]. To date there have been no survivors. If more than one individual activates the item in the span of one day, all will become Targets of the following night's assault. SCP-517-01 will appear from multiple areas while "hunting" multiple Targets. However, due to the resultant chaos during the test (517-34c) in which this was discovered, all measures are to be taken to avoid multiple activations. Remote viewing of the expected points of origin of SCP-517-01 during testing revealed arms extending from points around corners and otherwise off-camera, eventually crowding out the video feed. Fragmented, unidentified human DNA has appeared in the areas utilized by SCP-517-01; ultimate origins are still currently unknown. Samples from several "fortunes" as read by SCP-517. ██/██/1993: How many times should somebody be told to be good? ██/██/1994: Your mother raised you better than that. I'm sorry, but fair is fair. ██/██/1994: You try to be good; you should try harder. ██/██/1994: Some people don't know how to be kind. You'll know soon enough, won't you? ██/██/1997: People who do terrible things deserve terrible things. You've brought this upon yourself, my dear. ██/██/1998: You'll find out, soon enough. ██/██/2002: You look like you've made some mistakes. Some things are unforgivable, aren't they? ██/██/2002: Do you think they've forgotten?